Juggling Games, including Wii Fit Plus! As anyone who knows me well can tell you, I’ve been a prolific juggler at various stages in my life. I was president of the Juggling Club at the University of MN for about 2 and 1/2 years, and I’ve juggled on and off for at least 17 years now. 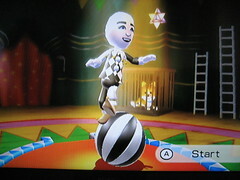 That’s the main reason that I tend to pick up any new juggling and/or circus related games that appear on the market. They’re usually terrible, but I have a small collection, for various ancient consoles mostly, and now, increasingly, for the iPhone.